ITS supplies sophisticated Elatec TWN4 and RF IDeas pcProx Plus multi-frequency, programmable card readers that provide the advantages of reading both proximity and contactless smart cards in one reader allowing organisations to use multiple card technologies. The pcProx Plus is also available in an ultra slim version, which allows for easy and elegant installation in recessed compartments and is currently available for HP, Ricoh and Toshiba eStudio multi-function devices. These readers, along with PaperCut MF print management software, create a secure print management solution that features authentication, pull printing, job accounting and charge back while enabling compliance with print policies. ITS also provides a free card testing service whereby you simply send us the card and we will test and make sure that it is fully compatible with the appropriate reader and the PaperCut embedded application. If your customer’s card type is not listed above please do not hesitate to contact us. Please note that not all card readers are compatible with all embedded solutions. Please contact ITS to discuss compatibility. The new TWN4 USB Front Reader offers unprecedented flexibility, convenience and cost-effectiveness for an authentication solution. 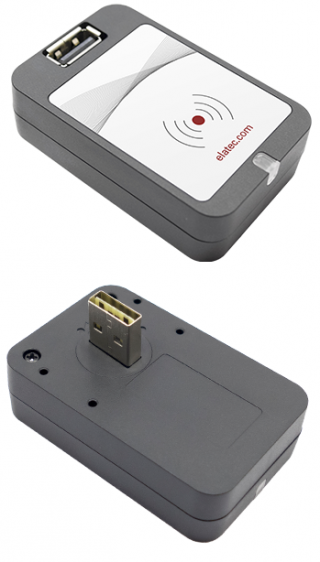 The Card Reader Mounting Kit is designed to house and hold the installation of RFID readers where it is not possible to embed the reader into the machine, available in black or white. The kit consists of one ground plate and two brackets with screws and a double sided strong adhesive pad. The kit consists of one bracket holder, one cable raceway, one outside corner and three cable clips. It can be assembled on the left or right side and there are also optional additional screwing hole located on the base plate.